Crate training is the process of teaching a pet to accept a dog crate or cage as a familiar and safe location. Advocates claim that dogs are den-dwelling animals and that a crate can become a den substitute. While this is a widely held belief, there is little evidence to support it. Regardless, most puppies can learn to tolerate crate training if it is introduced properly. The initial stress from being confined can give way to "increased feelings of security, safety, and comfort" after repeated exposure to the crate. Long term or excessive crate confinement "may lead to emotional and behavioral deterioration over time." 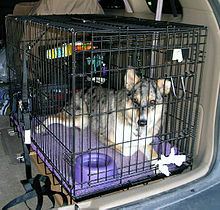 A dog in a wire crate strapped into a car for safe traveling. The average dog book refers to dogs as "den dwelling" animals and presumes that confining imparts a feeling of security to a puppy. Dogs, in fact, are not den dwelling animals, although in a variety of canids the dam will construct a nest (often underground) for the pups. The nest is a defense against predators and protection against inclement weather. The pups use it as a "home base" from which they explore, investigate and play. There is no door on the den which encloses the pups for many hours. Nevertheless, once a dog gets used to a crate, they can see it as a place of comfort and safety. The Humane Society recommends crate training to create a place of security and comfort for a dog, while cautioning that it is not the best solution to animal behavior problems. It is important to pick a crate that is the correct size for the pet and is appropriate for its purpose. Often larger crates come with some sort of divider so that a crate can grow with the pet. The correct size for a crate is just enough room for the animal to stand up without hitting their head, lay down and stretch out their paws and to turn around unimpeded. A crate for use at home can be larger than one used for travel. Crates used for international transport should adhere to international regulations stipulated by IATA. If the crate is too big the pet will be able to use one end for rest and sleep while using the other as a toilet, it will undermine one of the purposes of crate training. A dogs natural instincts are to eliminate away from the area in which they eat and sleep. So if a crate is small enough that they cannot possibly defecate while having enough room to sleep well away from it, a dog will 'hold it' as long as they possibly can. It's this instinct we take advantage of when using a crate as an aid for house training. During air travel, an oversized cage does not permit the pet to use the sides easily as a brace during turbulence. Likewise, crates that are too small pose a health risk by restricting and preventing proper air-flow and ventilation. This is of particular concern to domestic pets of a brachycephalic (short-headed) breed where the requirement is to allow extra room due to the high incidence of death in these pets during transport. Due to their shortened airways and limited ability to cool themselves through panting, overheating while traveling poses a risk to the health of such breeds. A dog in a soft crate. Crate training is often practiced with new puppies as a method of house-training. Puppies naturally do not want to dirty the place where they sleep, so they will try as much as possible to hold it while they are in their crate. Of course, young puppies can not control their bladders for long: about one hour for every month of age. Owners of young dogs will have to continue to take the puppy outside frequently. Locking the dog in a crate and letting it whine, bark and attempt to escape is common but such attempts to introduce crate training may cause a negative association with crating. The dog should become slowly accustomed to the crate. This can involve making a crate an inviting place by placing small familiar toys inside, moving the pet bed into crate, leaving unwashed items of the owner's clothing inside, rewarding pets for entering the crate and remaining inside, incorporating the crate as part of play, feeding the pet in the crate, allowing the pet to explore and use the crate until it is no longer intimidating, and eventually building to the pet sleeping in the crate overnight. Part of proper crate or cage training requires the pet owner to observe calm and relaxed behaviour around the crate. The pet will attribute any emotional responses such as raised voices or other nervous behaviours to the foreign object in their normal environment. It is important for the owner not to create any negative associations with the cage in order for the pet to accept the crate in a calm manner. Without proper conditioning, dogs may vocalize their distress and make efforts to escape the crates. Crating suppresses the dog's behavior, removes the dog's freedom of movement and is a negative punishment (removal of reward) under operant conditioning. Dogs who do not react well to negative punishment may find crating highly stressful. Long term or excessive crate confinement "may lead to emotional and behavioral deterioration over time." To the extent that crating reduces the amount of exposure to different environmental and social situations, it can make dogs more reactive (fearful or aggressive) or intolerant of novel situations. Crating "may significantly exacerbate the distress and emotional reactivity associated with separation distress". Behavioral problems that compels owners to crate train in the first place, may be exacerbated by the negative effects of crating. A dog may form a strong attachment to the crate eventually, feeling comfort and safety, after the initial feeling of distress and vulnerability. This behavioral effect has been compared to Stockholm syndrome. Dogs that are trained to sleep in a crate, when allowed to sleep in a bedroom, can show signs consistent with that of separation distress, suggesting that dogs may love their crate "perhaps in some cases more than they love the owner." This bond with the crate may interfere with the human-animal bond and exacerbate bond-related behavior problems such as separation distress and owner-directed aggression. Steven Lindsay in Handbook of Applied Dog Behavior and Training states that while "the role of crate confinement in the etiology of behavior problems has not been scientifically established [...] empirical impressions and logic dictate that it probably plays an important role in the development or exacerbation of many adjustment problems." He argues that "the widespread practice of routinely caging a dog at night and then again during the day for periods totaling 16 to 18 hours (or more) is an extremely problematic practice that should not be condoned or encouraged, because it probably underlies the development of many adjustment problems, including aggression." The purpose of crate training, he says, "should be to get the dog out of the crate as soon as possible, and to use the crate as little as possible in the service of training and space-management objectives." In Sweden, regulations forbid keeping dogs in cages or other enclosures below a certain size. Exceptions are made for some situations, such as during travels or at dog shows/trials. Even then, the dogs have to be walked every two hours or three hours. The size required for an enclosure to be exempt from such regulations starts at 2m² (21.5 ft², about the area of a single/twin mattress.) for a small dog and up to 5.5m² (60 ft²) for a large dog. Similar regulations exist in Finland. ^ "Traveller's Pet Corner". Iata.org. 2010-10-01. Retrieved 2011-11-03. ^ "Crate Training". Thedogtrainingsecret.com. Retrieved 2011-11-03. ^ "Why use a dog crate". labradortraininghq.com. Retrieved 2014-09-26. ^ Spadafori, Gina (2001-02-25). "How long can a puppy "hold it" at night?". Petconnection.com. Retrieved 2011-11-03. ^ "How to look after your dog (in Swedish)". Swedish Board of Agriculture. 2012-09-24. Retrieved 2012-10-09. ^ "Regulations and advice relating to the keeping of dogs and cats (in Swedish)" (PDF). Swedish Board of Agriculture. Retrieved 6 January 2014. ^ "Reasons for regulations on the keeping of dogs and cats (in Swedish)" (PDF). Swedish Board of Agriculture. Retrieved 6 January 2014. ^ "The cage is not a place for a dog (in Finnish)". Finnish Kennel Club. Retrieved 6 January 2014. This page was last edited 15:29, 12 December 2014 by Wikipedia anonymous user Imported>Egsan Bacon. Based on work by Wikipedia anonymous user imported>Egsan Bacon.